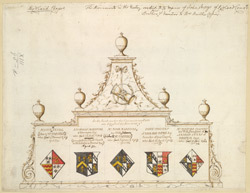 Drawings of a monument in the Vestry of Redland Chapel, erected by John Innys. It has inscriptions for family members, including his two sisters Martha (married to John Cossins Esq who built the estate and chapel) and Ann Innys. Also Nicholas Marissal and his wife Mary (sister to John Cossins) are included. John Cossins came from a wealthy grocer's family in London and he married the daughter of a Bristol merchant Andrew Innys, settled in Bristol and bought the Redland Court estate. He replaced the old manor house with a fashionable classical mansion and he also built this chapel in a similar style.